For centuries the shimmering waters of the historic Tippecanoe River have quietly marked the history of rural Pulaski County as the stream winds through the heart of the county�s landscape, its banks lined with lush woods and rich farmlands. The river was the lifeblood of the Potawatomi Indians who fished its waters and canoed home to camps along the shores. They were followed by pioneer hunters and trappers lured by plentiful wildlife. Early settlers harnessed the river�s energy to run saw- and gristmills. Later the Tippecanoe attracted weekend and summer visitors from the city looking for some quiet fishing and peaceful reflection. 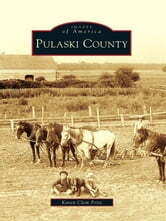 Pulaski County was established in 1839. Dotted with quaint towns, family farms, and locally owned businesses and light industry, the county has been shaped by a heritage of hard work, simple pleasures, neighborliness, and a determined self-sufficiency that comes of relative isolation. It is a rich and increasingly rare bucolic prospect�nourished by a vigilant river.